Be sure to catch The Playhouse Company’s 2Ist salute to this revered traditional music event, which takes place through the night in the Opera Theatre on September 22, 2018. One of the most colourful attractions on the entertainment roster of The Playhouse Company, an Agency of the Department of Arts and Culture, is its annual celebration of Iscathamiya, the traditional music genre which attained iconic international status in the 1980s under the advocacy of South Africa’s Grammy award-winning group, Ladysmith Black Mambazo. Now celebrating its 21st big-league event since being welcomed onto The Playhouse Company’s main stage by Chief Executive and Artistic Director, Ms Linda Bukhosini, The National Iscathamiya Competition attracts thousands of fans, who flock to support singing groups from all corners of KwaZulu-Natal, as well as the Eastern Cape and Gauteng. 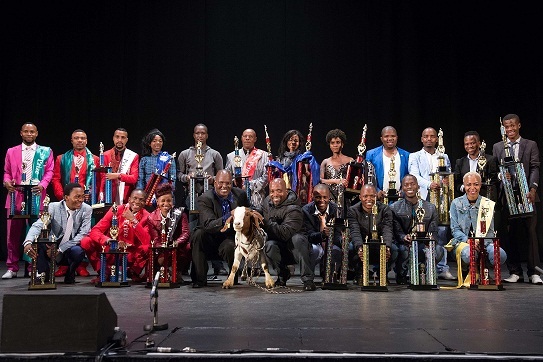 A total of 100 groups compete in this unique event, whose roots date back more than a century, for the coveted prize money totalling R200,000 in the following categories: Top 20, Standard, and Open Section. One of the most distinctive elements of the competition is a fun-filled fashion extravaganza involving 55 males and females, the ladies competing in the category known as Onobuhle (Beauty Queens) while the male fashionistas strut their stuff in the funky category known as Oswenka (Swanking). This invariably adds an extra dimension of delight and glamour to the cultural aspect of Iscathamiya. A unique a-cappella song-and-dance phenomenon, the genre of Iscathamiya represents a way of life with a strong moral core for many thousands of Nguni language speakers who live along South Africa’s eastern seaboard. Tickets for The Playhouse Company’s Iscathamiya Competition are available via Checkers/ Shoprite outlets of Computicket at only R80. For phone bookings call 0861 915 8000 or book online at www.computicket.com. Alternatively call the Playhouse box office on 031 369 9540/ 031 369 9596 (office hours). Special discounted parking is available for all Playhouse patrons at the Royal Hotel parking.